The Apollo Health goLITE M2 is the perfect solution to seasonal bouts of sleepiness, reduced energy or depression known as (Seasonal Affective Disorder). With the help of light therapy treatments, you may be able to treat your SAD. Whether you are at home or traveling you can easily begin your day with fifteen to thirty minutes of light treatment to boost your energy morning or evening. How Small is It? - It is small, but cute and more importantly, lightweight. When the light compact is closed it is slightly larger than a deli sandwich. The travel case is nicely designed as well. I plan to use my goLITE mostly at home, but I immediately tucked the travel case inside my carry-on tote bag. Having it there will serve as a reminder to pack the unit and take it with me on future trips. Cool! I'm a sucker for organization and implementing tips for less challenging travel. Before using the goLITE you will need to power it up for at least 8 hours by plugging in the provided AC/DC adapter. The user guide says that subsequent charges will only require 3 to 4 hours. I have yet to re-charge the unit so I cannot vouch for that. I typically use my goLITE for fifteen minutes on mornings the sun is not shining. If the sun is out I prefer natural lighting. Lucky me, my home has a solarium where I read the morning paper, plus I have a window next to my desk in my home office that gives me sun exposure in the morning. I keep my goLITE on the sofa table and utilize it on the dark and gloomy mornings. It is easily turned on with the push of the power button. The timer is preset for fifteen minutes which is sufficient time for me but it can be increased to thirty minutes if you prefer. I can even pause the clock/light mid-treatment if I want to get up and go to the kitchen for a refill of my herbal tea. This is a feature I really appreciate. Blue light is the latest in light therapy. Previously, only white light devices were available. Oddly, I like the idea of beating the winter blues with blue-colored LED lights. Apollo Health assures its customers that the light threshold in this unit has been well researched and is absolutely safe, but does warn anyone with eye disease or family history of eye disease to consult with your ophthalmologist before using the goLITE. I almost purchased the goLITE P1 because the portable M2 was priced at a whopping $40.00 more. That's a lot of cash! The P1 needs to be plugged into an outlet during your sessions. Fortunately, I stumbled upon a $30.00 off coupon while researching this product before I opened up my wallet and took the plunge. For the additional $10 I went for the M2. Supposedly the cord on the P1 unit is fairly short, another option is the P2 (cordless). Neither the P1 or P2 come with the travel case. But, either way, I think all the units (P1, P2, and the M2) are pricey. 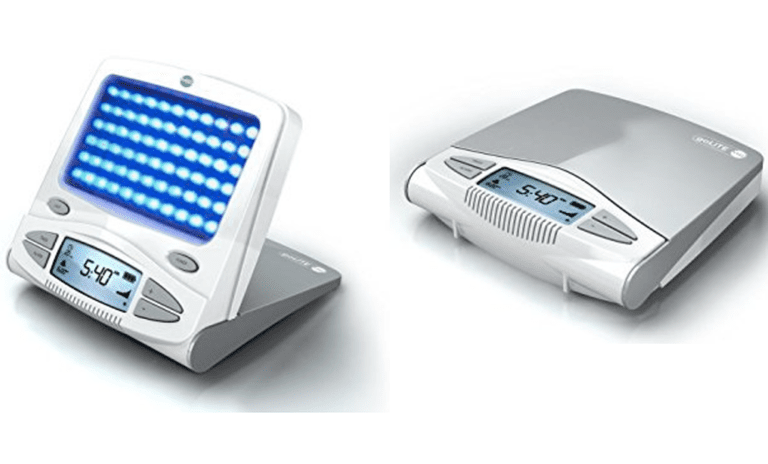 There are certainly more affordable light therapy devices to choose from on the market if you don't have the bucks to shell out for Apollo Health light therapy products. But, if you're considering the goLITE M2 price comparisons might find you a good deal - I say goLITE!